Have you seen rainbows in snow? After a rather large snowfall this winter, I stepped outside the next day, greeted by clear blue skies sparkling with ice crystals. Minute rainbows appeared in every crystal, in every snowflake! Happily, my camera and I got a workout around my yard and on the golf course, inspiring many photos of the landscape transformed magically by 2 feet of white, rainbow-filled wonder. A few days later, I began a painting based on this photo reference. This is our gorgeous old ponderosa pine, which rises about 65 feet from the ground in our front yard. 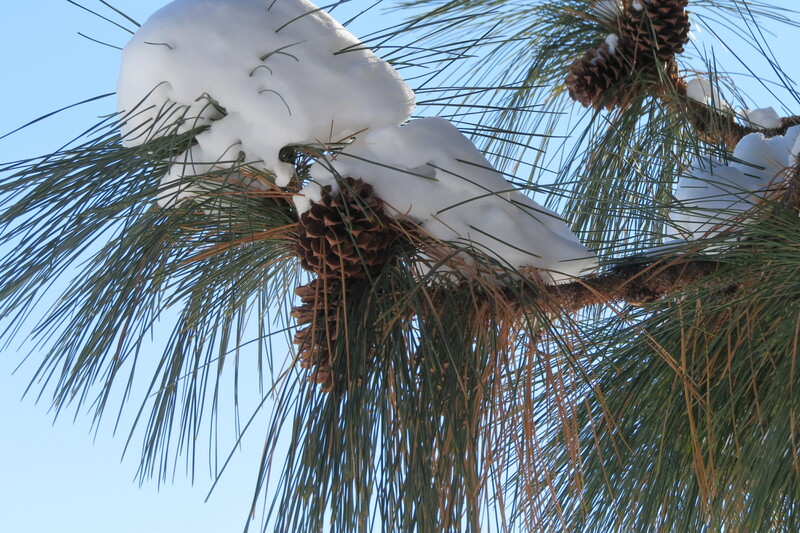 After taking photos, I dug through the snow and selected a handful of ponderosa needles. They are long, each about 6 inches or so. I took them into the house and set them out to dry on newspaper for a few days. Once the needles were dry, I prepared a textured Plexiglas with gesso, applied it very thickly, and scattered the pine needles into the surface in a random manner. You can see in the photo above, that I covered needles with gesso. 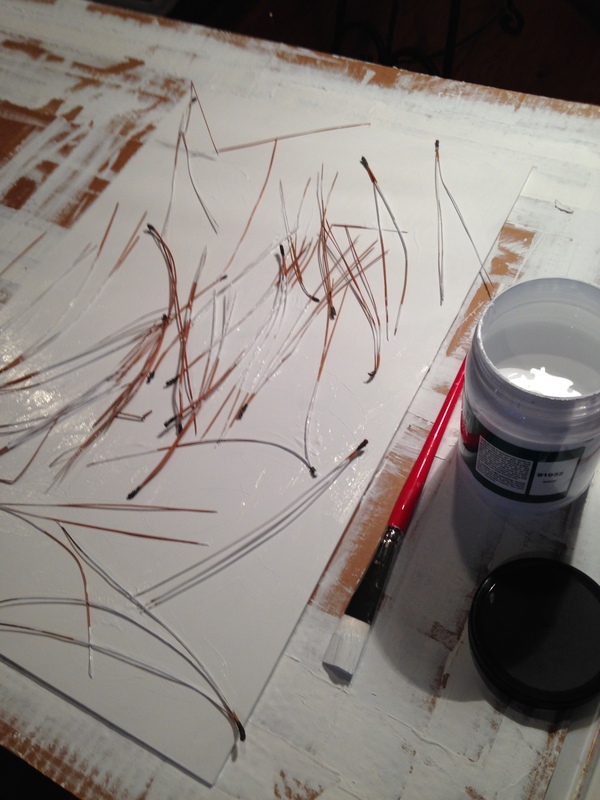 This “glued” needles into the plexiglas, making an interesting texture for the painting base. I planned the composition, organizing a large majority of the surface to remain textured white gesso. A pine cone focal point worked best in the upper RH third of the painting in this long vertical format. 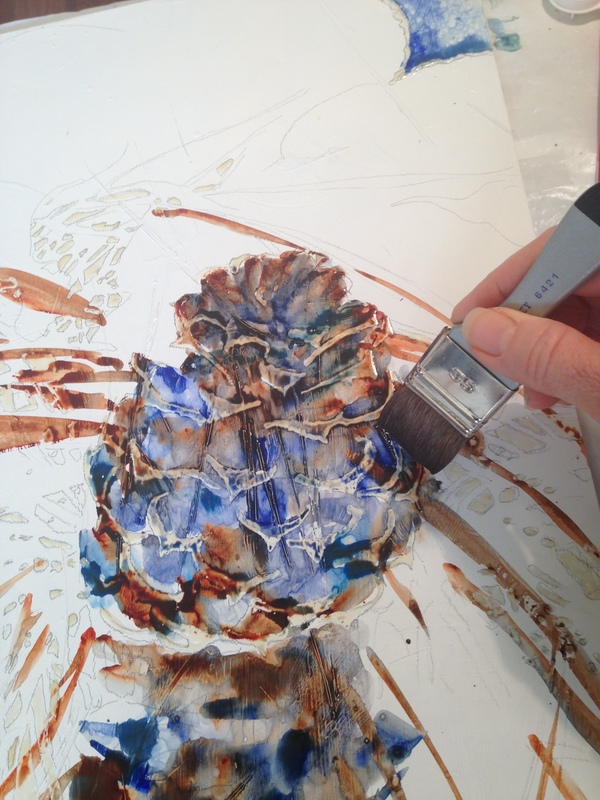 I painted the pinecone with cobalt blue, quinocridone burnt orange and ultramarine blue, using a very large, soft brush. 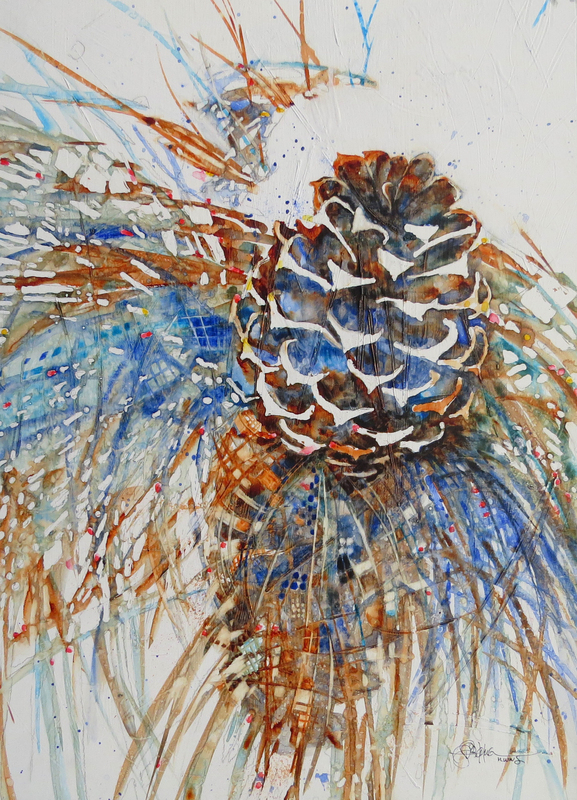 All the light edges of the pinecone were protected by liquid mask to remain white throughout the painting process. Enraptured by the pattern of needles behind the pinecone, I enhanced that pattern and added a few of my own in the shadows. Bright red, yellow, and blue squares pop throughout the painting, giving the impression of rainbow refraction of light in the snow. The photos do not show rainbows, but that is where artistic license comes into play. I imagine the images in my mind and add a sense of rainbow-sparkles throughout the painting. When set against a clear white background, the sparkle becomes real. 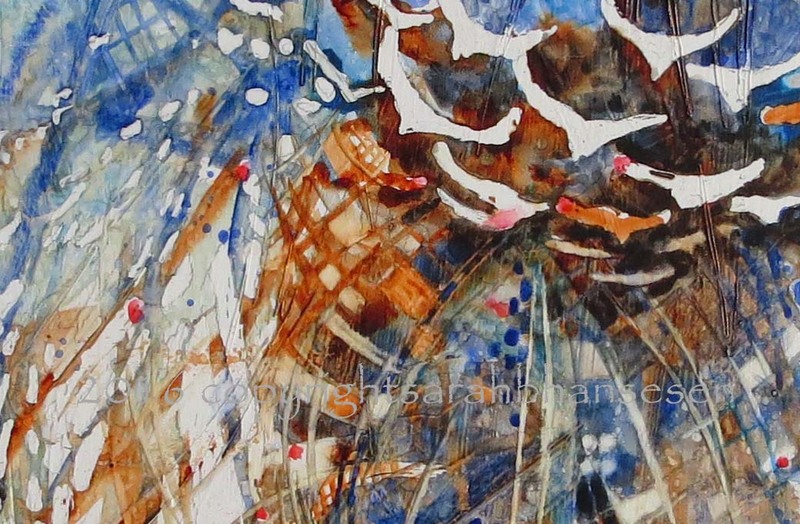 The resulting painting illustrates a beautiful balance of texture and composition against sparkling geometric patterns. To purchase, send me an comment. I accept PayPal and will email a PayPal invoice. Shipping extra. Prints available, sizes starting at 8×14 for $35. Keep creating and support each other!